One of those boats went by at 6:50AM and three had passed by 7:20AM. Either that or the one had gone by three times. The temperature in the trailer at that time was 68F. The temperature outside would have been much the same since all the hatches were open in the trailer. They were water skiing at 8AM. The birds were not bad at all. A few mourning doves were heard but nothing walked down the trailer roof. One had walked down the roof at supper time last evening so we felt we would have one or two at least this morning. We slept very well. We did not hear a thing and slept soundly all night. We got around, drained the tanks, got disconnected and on the road at 9:17AM. Eddie the maintenance guy came down and wanted to open the back gate but I wanted the challenge of the hill by the office. The old Duramax dragged the Equest up that as though there was no hill at all. We were out of the farming area at Parker and saw no more of those hay farms so were unable to get a photograph. 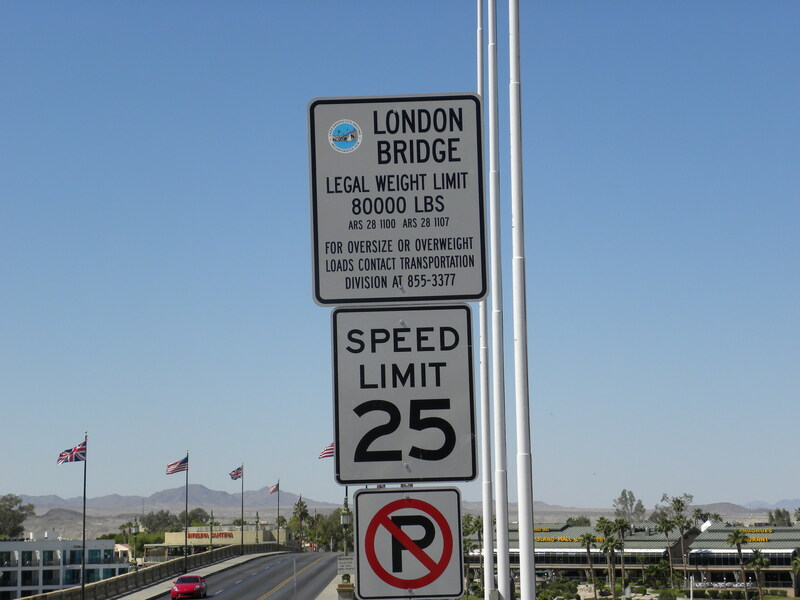 We made a couple of scenic view pit stops before arriving at London Bridge in Lake Havasu City, Arizona, at 10:29AM. 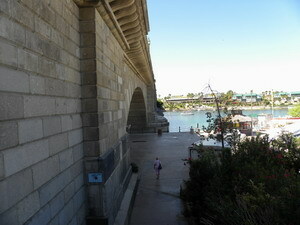 It is not true that the man who bought the bridge for $2,460,000.00 thought he was getting Tower Bridge. He was Bob McCulloch of McCulloch Chain Saw fame and he knew exactly what he was buying. He was the second highest bidder. The highest bidder was Red Skelton but Red did not know what he would do with it so they sold it to the second highest. It is quite a story, the buying, shipping and rebuilding of the bridge. It created Lake Havasu City in the Arizona desert. Bob had been fascinated by gasoline engines and high speed boat racing. He won several high speed boat races while in university and gave this area of Parker, Lake Havasu City the designation “the personal watercraft capital of the world”. This is according to literature on the history of the area. 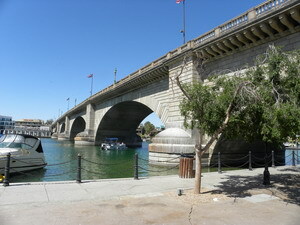 Havasu comes from the Mohave Indian word for “blue water”. The Tower Bridge would not look near as good on that site as the old London Bridge. It is definitely the better of the two I am sure. 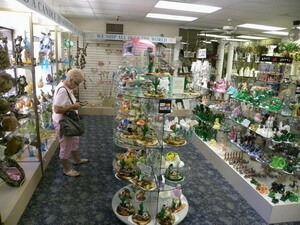 Joan and I spent our time around the bridge and in the London Bridge Candle Shop. We bought a few things and left around 11:45AM. 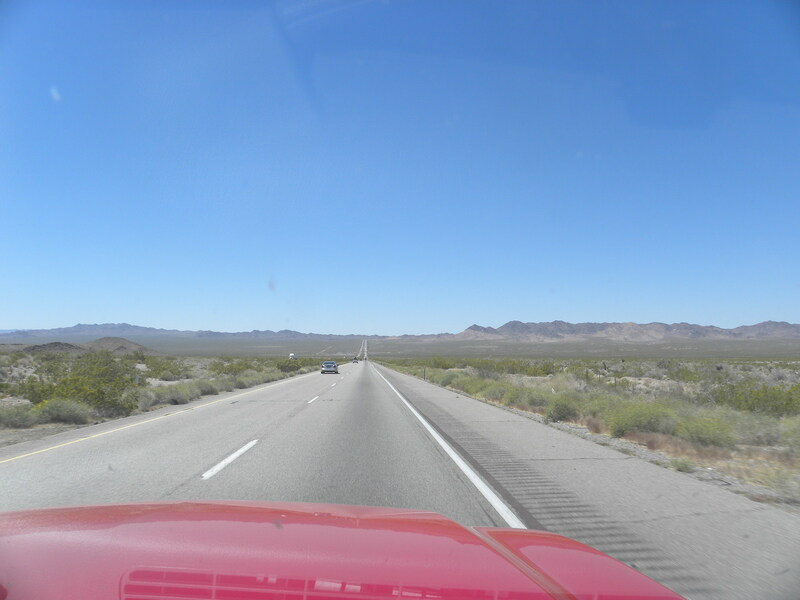 We travelled up 95 to interstate 40 and went over into California. Joan suggested I fill the diesel tank but I felt I had lots for the distance on the chart. The problem was it was all up hill. 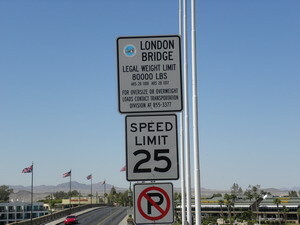 They had a lane just for the trucks and the signs said cars pulling trailers were not to exceed 55 MPH. A car would never exceed 55 MPH going up that wall with a trailer hooked on it. The little engine light stating the truck needed servicing came on. The third time it has done that this trip. It must overheat somehow but all the main gauges state everything is calm, cool and collective. We were probably up around 7,000 feet but I can find no definite figure on it. The fuel gauge went to E, then it went to a little bell ring, an emergency fuel light came on and the gauge continued going down. We made it. We pulled into Ludlow Chevron, Ludlow, California at 2:05PM our time, that is Arizona Standard Time. We will not change time until we get to Alberta. The truck's tank holds 32 U.S. Gallons. She took 31.858 gallons at $4.899 per gallon for a total of $156.07. When she hits half full from now on I'm filling. I am not going through that again. There was nothing there. 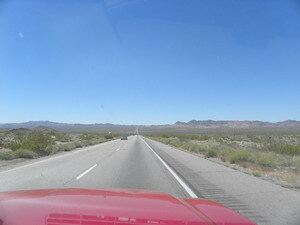 Nothing but desert and dirt along the roads. The interstate was four lane. 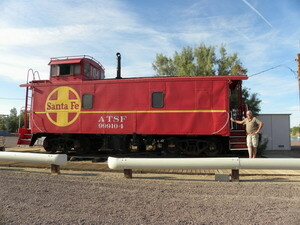 There was a double track railroad track not far from it with lots of trains on it. We watched two container trains meet. They both were very long, maybe two miles long. One wonders if there was anything in the containers heading west. So much comes from China and little goes back apparently. 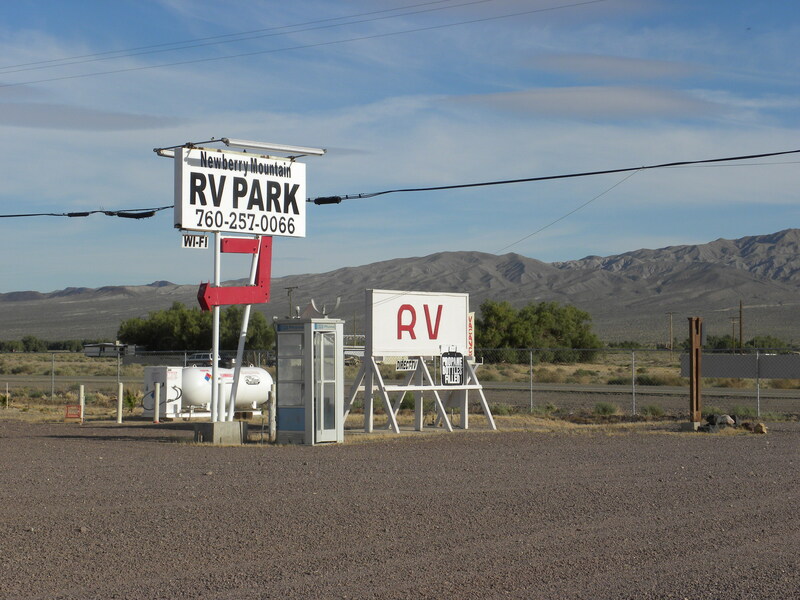 We pulled out of Ludlow at 2:14PM and pulled into the Newberry Mountain RV Park, a High Desert Park at 47800 National Trails Highway, Newberry Springs, California at 2:49PM our time. 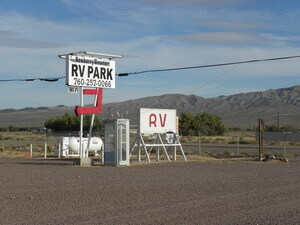 This is a camp on Historic Route 66. We put 326 kilometres on the vehicles today. Lena did it for less. Lena was an elderly lady in our village back home when we were kids. I will never forget the time we had a few musical instruments in our kitchen one evening making one heck of a racket. There was no one there who could play anything. We phoned Lena to see how we were doing. It was not long before someone stuck the phone in the trumpet and gave it a horrendous blast. It was a wonder some of the phone amplifiers did not move to another county. I then asked Lena how we were doing. She thought it was great and we should do it often. That was Lena. Lena's father, brother, son or maybe all three were executives in the railroad industry. This gave Lena a free pass on any railroad in North America. Lena used to brag that she went from Nova Scotia to California for $3.25. This would have been seventy or eighty years ago and no doubt she did it. After supper Joan and I walked around the park. She took a photograph of me next to an old railroad caboose they have for a tourist attraction. It was not open so we did not go inside. 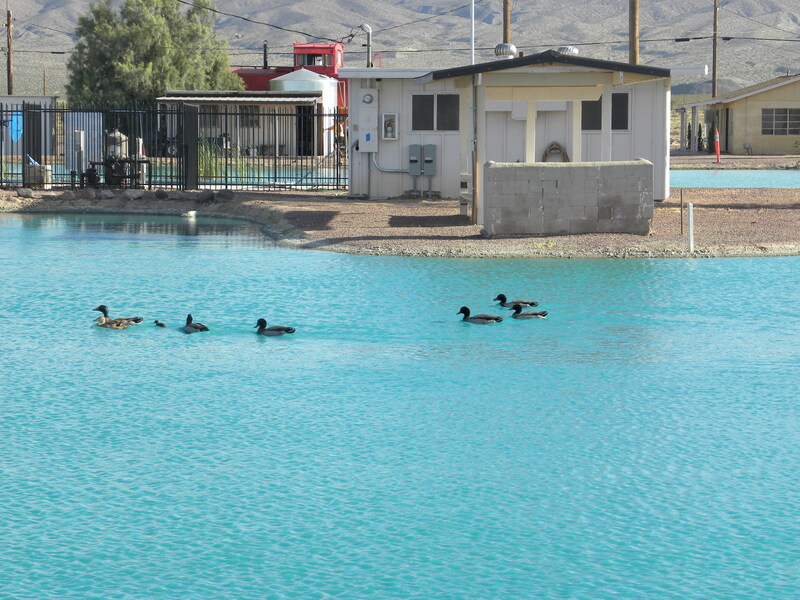 There were about one dozen ducks there in the pond or lake. They have that stocked with fish. There were two female ducks only. They were mallard ducks and each female had a male in close pursuit. One female had one duckling she was trying to protect. The ducks would swim off and that lone duckling would follow as though he had been over-wound. His feet were throwing water from both sides until he caught up with his mother. He was certainly cute. 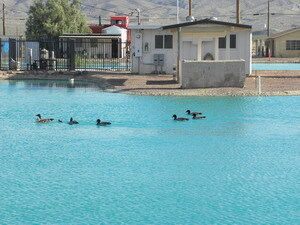 There were no doubt more ducklings that had been caught by some vulture or animal. Joan caught the little guy in second place here. We have WiFi here but it has to be the most frustrating piece of equipment one could try and operate. We tried three times to let the folks home know we are okay and finally gave up. We could neither answer their email nor send them one. This daily report will have to wait with several others. The wind blew very hard all evening. The trailer was bouncing around some. We have the two forward stabilizer jacks down and locked and the main horse trailer electric jack is up. The truck is still connected and has been since Gold Canyon. This interstate 40 is known for high wind but I did not realize there were places where it was so steep. We read this evening when not trying to get the computer to work. Joan has g-mail and managed to get a couple of notes through to friends and family on that. We called it a day and went to bed and let the wind rock us to sleep.